Our first conversation is with Carlie Littlefield ’21, a member of the Princeton women’s basketball team. Carlie Littlefield ’21 teaching Math. For additional photos from Carlie’s experience click here. The most impactful thing I took away from this experience was how important having a solid support system is in the grand scheme of things. The main purpose of this program is to encourage children in the area to continue their education, as many of them have parents who are not supportive of their dreams of getting an advanced education. While talking to many of the children about their home lives and aspirations, I was reminded how blessed I am to have parents, friends, teammates, coaches, and Princeton alumni who support my dreams and are willing to help me reach my goals. My favorite memory of the trip happened the first time I went to the school during our lunch break. I went there to get a few shots up on the outdoor basketball hoop in the school’s courtyard. I was expecting to be alone, but when I got there a small group of kids had started to congregate in preparation for the afternoon session to start. They came running to the front gates to greet me with big smiles, and proceeded to follow me over to the basketball hoop. At first, I was nervous that I wouldn’t be able to get up any shots after all, as I figured they would take the ball from me and start playing with it themselves. After all, I was outnumbered and did not speak their language. To my surprise, my first shot was rebounded and eagerly passed back to me. Shot after shot, the kids continued to chase down my rebounds, pass the ball back to me, and cheer for the shots I made. As time went on and the group of kids got larger, the other kids would fill them in on the game — to rebound the ball and pass it back to me. However, if one of the kids did not follow these rules, they would scowl at them, which would usually solve the problem rather quickly. I was amazed at how eager and happy they were to simply observe and help me, rather than take the ball to play themselves. So, to repay their unselfishness, I allowed them to take turns shooting while I became the ball chaser after I felt I had had a long enough turn. This anecdote perfectly describes the children’s unselfish and cheerful nature. There were many “welcome to Vietnam” moments the first couple days of the trip. For starters, the four hour bus ride from Ho Chi Minh City to the camp site in a packed bus without an air conditioner was a good welcome to the extremely hot and humid Vietnamese climate. Once we got to camp, the American coaches were shocked to discover our rooms at the camp were not equipped with showers– just buckets and a drain — which was another humbling realization. Another thing I wasn’t prepared for was how awkward meeting the kids was for the first time. At first, the kids just stood around us, making sure not to get too close. They gawked at us and as some of them tried to sneak pictures of us on their phones. Neither of us knew what to think of or how to communicate with each other. Thankfully, the discomfort didn’t last long, as any language or cultural barrier melted away as soon as we began playing games with them. 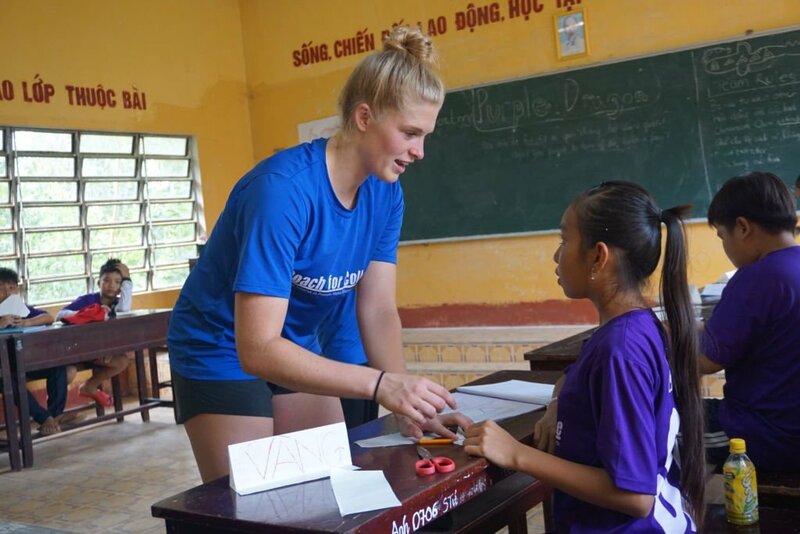 The language barrier was not as difficult in the classroom as it was on the basketball court. To teach math, I was able to learn the numbers in Vietnamese after the first couple days (and a lot of practice) and I was able to hold up fingers to signal numbers, which made it rather easy. However, basketball was difficult to teach with the language barrier. Basketball is not a familiar sport in Vietnam so the Vietnamese college students also had some trouble translating what we were trying to teach. To overcome these difficulties, I did a lot of demonstrations and would go up to children individually to work through the specific motion with them, whether it be perfecting a follow through or throwing a chest pass. As our basketball lessons got more advanced and we moved into live three on three games, I ended up teaching them a few English words so I could direct them from the sideline. These words were “pass” and “shoot.” Teaching by showing and using gestures were my most successful teaching strategies. I would strongly recommend this program because it gave me the opportunity to experience a completely different way of life and form special and lasting relationships with athletes from other schools, Vietnamese university students, as well as the Vietnamese children. I also felt like I was able to truly make a direct impact on each of the children’s lives. This program is an ideal length of time, and you’re able to both serve a community and see different areas of Vietnam on the weekend excursions. The thought of going halfway across the world alone to a rural area of a developing country was extremely intimidating, but I’m so glad I pushed myself out of my comfort zone to take part in this program. To the PVC supporters, I would like to sincerely thank them for their contributions, as this experience had a profound impact on me and the Vietnamese children. Because of their generosity and investment, I will return to Princeton a better servant leader with a greater world perspective. Their gifts change lives and we’re so fortunate to have so many alumni who support Princeton athletics with their time, talent and money. One striking difference that was immediately apparent was the simplicity of life in rural Vietnam. At the guest house, we used the same bucket to hand wash laundry, flush the toilet, and shower. This approach seems way less wasteful and more efficient than how we go about these things in the U.S. Culture-wise, we are much more blunt and direct about sharing our opinions on things, while the Vietnamese tend to be more reserved and do not share their views openly out of respect for others. Another difference was the amount of unnecessary stuff and material possessions we have in the U.S., while the people of Vietnam tended to have only what was necessary. By experiencing the way of life in rural Vietnam, I realized how trivial many of my complaints are in the U.S. My outlook is much more simplistic and grateful now. The most beautiful part of Vietnam was a city called Can Tho, which was located on a river. Can Tho had a beautiful pedestrian bridge and other modern buildings and hotels alongside many temples, a traditional outdoor market and ancient buildings. I had an opportunity to travel to Thailand after the program and I loved seeing the Phang Nga Bay in Phuket, Thailand. The vivid blue water and the dramatic cliffs made for a very picturesque scene. On a typical day, I would wake up at 6:10 am and spend a little bit of time getting ready for the day before heading out to eat breakfast. The 6th graders came for the morning session beginning at 7:00 am, and I would teach two, 40 minute sessions of basketball and two, 40 minute sessions of math. Before the 6th graders went home, we would also have a 40 minute lesson on different lifeskill topics, such as teamwork and willpower. The morning session got done at 11:00 am everyday, and then we would bus back to our guest house and have our lunch break. The afternoon session began at 1:15 pm. The 7th graders came for the afternoon session, and it was structured identically to the morning session, with their lessons being a bit more advanced. The session ended at 5:15 pm, and we bussed back to the guest house for dinner. We would then have our nightly lesson-planning meeting. For this meeting, all Vietnamese and American coaches as well as directors would gather in one room and talk about what kind of activities we could add to our lessons the following day to make them more interactive and memorable for the kids. Once we were done meeting, it was time to rest up for the next day!